Place sugar cube in old fashioned glass and saturate with 2 dashes of bitters, add a dash of plain water. Muddle until dissolved. 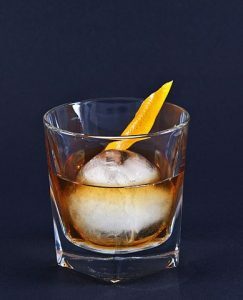 Fill the glass with ice cubes and add 4.5 cl of bourbon or rye whiskey. Pour 6 cl gin and 1 cl vermouth into mixing glass with ice cubes. Stir well. 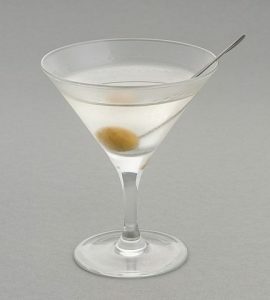 Strain in chilled martini cocktail glass. 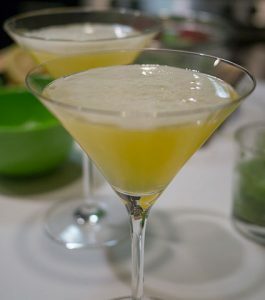 Squeeze oil from lemon peel onto the drink, or garnish with olive. 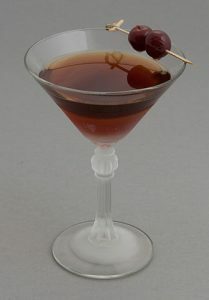 Stir 4.5 cl Scotch, 2.5 cl sweet vermouth and 1 dash bitters over ice, strain into a chilled glass, garnish with a cherry, and serve straight up. 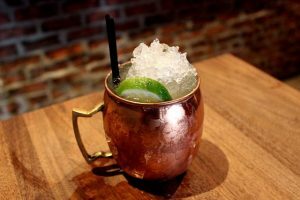 Combine 4.5 cl vodka and 12 cl ginger beer in a highball glass filled with ice. Add 0.5 cl lime juice. Stir gently. Garnish. 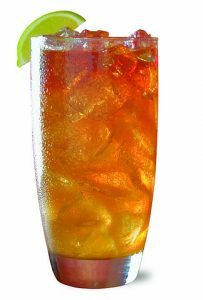 Fill glass with ice, add 6 cl dark rum and top with 10 cl ginger beer. Garnish with lime wedge. Shake 2.5 cl vodka citron, 2 cl triple sec, and 1.5 cl lemon juice and strain into a chilled cocktail glass rimmed with sugar or in a shot glass. Heat 8 cl coffee, 4 cl Irish whiskey and 1 tsp brown sugar; do not boil. 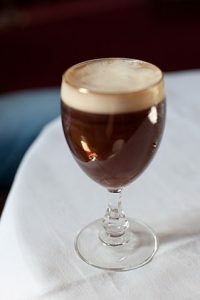 Pour into glass and top with 3 cl fresh cream; serve hot. Click each of the cocktails to see a photo and the recipe to the right.